The Owners’ Committee of 4 Mandolong Road in Mosman realised they could no longer keep patching up their leaking roof. The 40 year old building, a complex consisting of thirty apartments in five adjoined blocks, was beyond short-term fixes and required a long-term solution. Initial quotes were confusing and varied greatly in price. The Committee were daunted by the prospect and knew they had to choose carefully for such a large project. Then came the tender and quote from Buildcore Constructions, which while not the cheapest, was the smartest, offering a complete overall solution and additional benefits. “We liked certain parts of their tender, we liked the product that they were recommending … we liked the timeline and we liked how they were planning to go about it … and for those reasons the Committee recommended Buildcore and the Owners voted to accept their quote rather than simply opt for the cheapest quote,” said Tina Claridge, Secretary of the Owners’ Committee. Buildcore looked at the problem from all angles and thought not just about fixing a leaky roof but also about other aspects. Buildcore identified the need to add a roof hatch to provide access for the project and also any other projects down the track. They were also the only company to add insulation as part of their quote. “They listened to us and gave us a tender that addressed our concerns but applied their own thoughts to it and said we would also suggest you consider these things as well …” Tina said. Buildcore provided a four layer system consisting of a vapour barrier allowing the slab to breathe as well as the insulation not only for thermal purposes but to move the dew point in winter from top floor ceilings to above the membrane, removing mould issues from apartments. Then there was a stainless steel testing mech in order to provide accurate leak testing of the new system and the all-important PVC membrane which is guaranteed for a minimum of 20 years to hold a water-tight seal. Along with the detailed works provided, Buildcore pride themselves on the relationships they form with their clients. The Committee was thrilled with the service and communication they received from Managing Director, Mark Granger. “… We liked Mark Granger … We liked the way he ran the job. He made himself available as often as anybody needed to speak to him. We had regular contact on an as needs basis and on a scheduled basis. He was responsive to all contact by other owners, not just the committee… And it was a happy association,” Tina said. The project was finished on time, within budget and exceeded expectations. What began as a formidable prospect ended up an excellent working relationship and the committee were constantly reassured that they had made the correct choice. “We were glad that we were dealing with somebody that proved to be trustworthy and did what he said he would do.” Tina and the small project team on the Executive Committee said. Overall the project was a great success. Not just that it fixed the problem but also in that the building now has complimentary benefits such as the insulation, roof access and the infrastructure to pinpoint leaks. 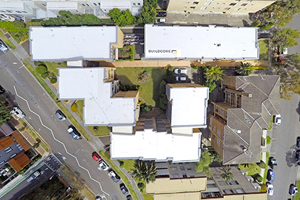 Another key benefit for the owners is Buildcore’s innovative Roof Register. This brand new register, maintained via our Strata Agent, enables the tracking of every maintenance job, such as antennas and window cleaning etc. Owners are confident about the future. With all the rain Sydney has had since the project there has not been one issue. An added bonus is the insulation is keeping residents cooler in summer and warmer in winter. The owner’s committee of 4 Mandolong Road would happily use Buildcore again if necessary and would not hesitate to recommend them. What could have been an expensive disaster or messy quick fix instead proved to be a great achievement. Buildcore provided a complete solution that no other company could match. The building in Mosman will be dry and comfortable for many years to come, a testament to Buildcore’s expertise.